One of the real thrills of our business is to hear the stories of the relationships between homeowners and their homes. Often, people look at their home as simply an inanimate object. But others look at their homes as though they are a close, longtime friend. MaryGrace F. and Kathy K. are the latter. Their delightful Clifton Heights home is steeped in history and they have spent quite a bit of time uncovering its past while returning it to its original splendor. 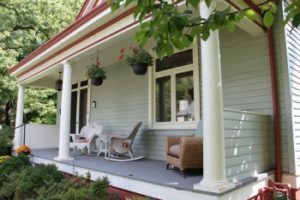 Originally built in the late 1800s in the Clifton Heights area overlooking the Ohio River, the home and surrounding property was purchased by Warren Clay Callahan, a developer who used the home as his residence and business office. In 1910, Mr. Callahan subdivided the property around the home and created the Indianola neighborhood. Mr. Callahan named one of the subdivision streets after himself (Warren Road) but that road was situated behind his house. It is speculated that to correct this situation, Mr. Callahan moved his home about 500 yards to its current location fronting Warren Road and facing the Ohio River. MaryGrace and Kathy approach the renovation of their home in stages and each stage seems to bring an unexpected thrill, like finding out that their house was moved. Other unexpected discoveries include finding an old linoleum area rug in good shape under a layer of shag carpeting in their attic bathroom and uncovering a recessed area in the dining room behind lathe, plaster and wallpaper to reveal late 1800s era wallpaper. The couple converted the recessed portion to a curio cabinet and it is now on display in the room. The latest renovation involved replacement of a vinyl front facade window. MaryGrace worked with the Door Store and Windows to create a place to show off a stained glass panel made by Kathy several years ago. 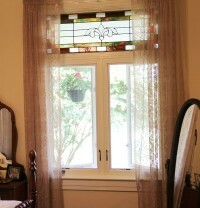 The window happened to be the same width as the stained glass art, so we were able to design a two-wide Marvin Ultimate Casement window with a transom to display and protect the piece of art which was mounted on the inside transom frame. The stained glass artwork brought a personal touch to the window replacement project and will provide lasting memories for the homeowners.